Ebright's furniture ottomans are constructed of wood, felt and bronze. 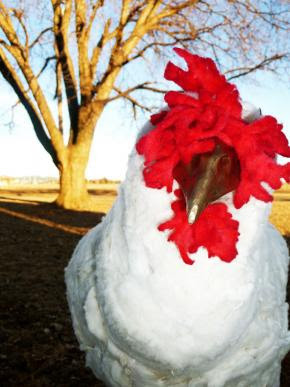 Would you believe me if I told you that this chicken wasn't real? Well, it isn't. My ridiculously talented sister-in-law, Sally, had a vision and brought this creation to life! Sally is about to graduate from Kansas State University in May with a Bachelors & Masters in Interior Architecture. She was challenged at school to come up with something unique for her final furniture project. 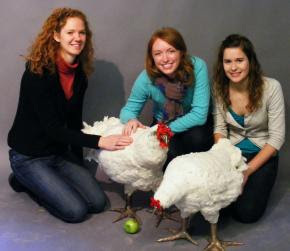 In addition to the fact that these chickens look so real they also serve a function. They can be used as foot stools!! How crazy is that?? These creations were entered into a contest at school and won first place! They even got the attention of a newspaper in Topeka, Kansas (the capitol). Sally was asked if her master pieces could be featured in the paper! Along with a write up, she even had 6 full color photos displayed!! I'm pretty sure her phone hasn't stopped ringing. 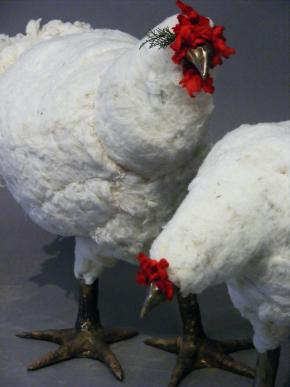 Before long, she's going to have a booming business with chicken ottomans! You can read the full article HERE. 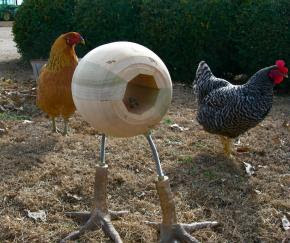 The body of Ebright's chicken ottomans are made of cottonwood logs fashioned into an egg shape. 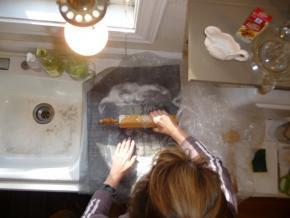 Susan Ebright helps card the wool that will used for the combs and wattles of her daughter's creations. 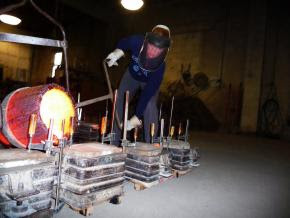 Ebright pours hot bronze in the molds for the beaks and feet of her chicken ottomans. Ebright's ottomans are sturdy enough to sit on. A spring in their necks allows the heads to nod when patted. Sally Ebright, center, will show off her chicken ottomans at an upcoming gallery show featuring furniture constructed by fifth-year architecture and product design students at Kansas State University. Samantha Lang, left, and Sara Ege, also will show their works in the show. those are wonderful! sally is definitely talented... just like the rest of you ebrights :) i could totally see those being a hot item at a farmers market or country store. btw, you were missed this weekend... hope you had fun on your trip! Wow that's some talent! How creative how did she come up with the idea? Oh my gosh! These are so crazy! I love it :) My mom and dad went to K state too...I know they would be proud!